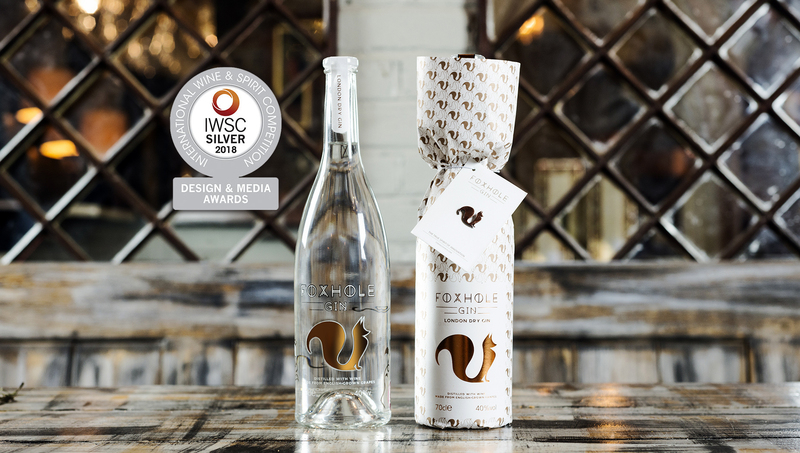 Winner of a Silver IWSC 2018 Design Award, our branding and packaging for Foxhole Gin has helped this innovative English brand take the premium gin market by storm. Foxhole Gin’s USP is that it’s a truly sustainable product, made using grape spirit distilled from a by-product of the English wine industry. As well as addressing a practical waste issue, it reflects consumers’ broader environmental concerns, and taps into a growing awareness of, and interest in, provenance and authenticity in food and drink products. We produced the original design and packaging for the launch of Foxhole Gin in 2016. The product proved an immediate success with consumers, but in late 2017, we were asked to develop a new, more premium bottle in response to feedback from the trade. Since Foxhole Gin includes grape spirit, we specified a perfectly clear, 700ml Burgundy wine-style bottle, giving it a distinctive outline on the shelf, and reflecting its unique origins. Each bottle is screen-printed by hand with a precious-metal ink, which turns copper (referencing the traditional copper still used to produce the grape spirit) when fired at a precise high temperature. A white ceramic ink emphasises the details in the design. The back and sides of the bottle are decorated with a custom illustration of vine leaves, further reinforcing the gin’s oenological connections. The bold, bushy-tailed fox logo, which we also hand-drew, appears in copper on the front of the bottle, and in a subtly embossed form on the top of the copper-foiled seal covering the glass closure. The client also asked us to develop a more distinctive, cost-effective alternative to the usual cardboard gift box. Our solution was to wrap the bottle in beautiful paper, featuring a repeating pattern of the fox logo, with the product name, logo and details copper-foiled on the front. The neck is tied with a label, which carries a copper pin badge in the shape of the Foxhole logo, which has already become a highly sought-after item in its own right. Since the new design’s launch in November 2017, Foxhole Gin has seen an average sales growth rate of 292% based on the previous year’s figures, and the old bottle design. In October 2018, it took the inaugural International Wine & Spirits Challenge (ISWC) Silver Award in the Spirits Artwork & Bottle Design category. "Extra special thanks to you all at Warren Creative, you guys do an amazing job for us and we’re so proud of the results of your efforts."